​Charity Commission and operate within strict guidelines. The charity relies on donations, sponsors and the goodwill of volunteers. The aim of the rescue is to provide shelter, care, love and affection, medical treatment and re-homing, where possible for Old English Sheepdogs in need, who come to us by reason of sickness, poor circumstances, hardship, maltreatment, stray, injury, unwanted or homeless. 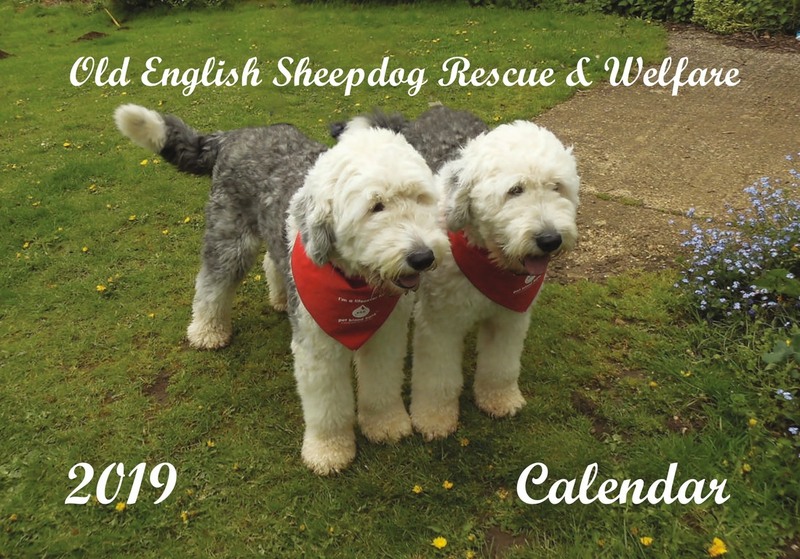 The Charity also works with other all breed rescues large and small to help the plight of unwanted Old English Sheepdogs. The charity is run by Trustees who also play an active role in caring for the dogs. The dogs live with Julie and her husband, where they have 2.5 acres for the dogs to safely exercise, run and play - or plod as the case may be! Originally Julie worked with another OES Rescue, and before that with the RSPCA. She is also a qualified dog Behavioural Trainer and keeps up to date with latest training methods. Her own rescue Old English Sheepdogs all have their KC Good Citizens Dog Scheme Gold Awards and have trained for various disciplines/sports. They can sometimes be found out and about giving demonstrations, promoting the breed, obedience & rescue. Tailor made rehoming in Northamptonshire. Dogs who come into our care are assessed in our own home. Meanwhile we look at available homes on our waiting list and try to match the right home for each dog. After lengthy interviews and checks potential new owners are invited to spend the day with us and the dog. New owners will learn how to care for their new friend; lead walking, grooming, diet and play. Even though many of our adopters have had dogs from us before - each dog is different. After rehoming we are always there for support and advice. A group stay helps to calm these young excitable dogs! Please, please do check things thoroughly, we often get dogs into rescue which have previously been sold on line. Watch this video from the Pet Advertising Advisory Group (PAAG). As a guide, for dogs re-homed by us, new owners will know that the dog has been assessed in a home environment, with people and other dogs. There will be a behavioural and training report, a letter for your vet with medical history, advice on care, diet, daily grooming and handling and dogs are vet checked, neutered/spayed, vaccinated, wormed and microchipped before re-homing. This does not mean that all the dogs are 'perfect' in every way. If we find that a dog has an issue, we will tell you and also how to handle it. We also provide back up after re-homing and if for any reason the dog can no longer stay with you, we will have them back here - we insist on it! ​Click here to read about Charlie and how your support has helped him to live a painfree normal life. Support the Rescue with a local lotto ticket. Unlike the National Lottery, Local Lotto allows you to nominate which charity you support. 50p in every £1 ticket goes to Charity and when OES Rescue & Welfare are nominated we receive 40p from each ticket. Our target is 50 tickets which would bring us £1040 in a year ! You can buy your ticket here ..
​NEWS : we have only been registered a few weeks, with 7 tickets sold and two of our people have won a prize ! Rest assured we will care for your dog and work tirelessly to find the right home for him or her. We understand how difficult this decision is for you. Dogs come to us for a variety of reasons and each one is cared for by us, in our home, until the right home is found. Whilst details of previous owners are never passed on, you are always welcome to contact us to see how your dog is getting on. We may even be able to send you a photo or video as new owners always keep in touch. All our work relies on the kindness of sponsors, every donation, however small, makes a difference to the dogs. There are now more ways than ever to make a donation and we have just added a paypal "donate" button (see below). Gift Aid on donations made to us (however small). already paid (or will pay) on your donation to us! Currently we can claim 20p in every £1 you donate. Sponsors and donations are always needed to help care for dogs which cannot be rehomed and for medical attention for dogs who come in to us who are very poorly. We've tried to talk her out of doing this but she is determined ! Not only that, she will now be joined in the Sky Dive by her Mother, Daughter and Brother. You can sponsor Liz for either Cancer Research or Old English Sheepdog Rescue & Welfare. OES Rescue & Welfare use Paypal Giving Fund as there are no charges or commission which means we receive 100% of your donation. 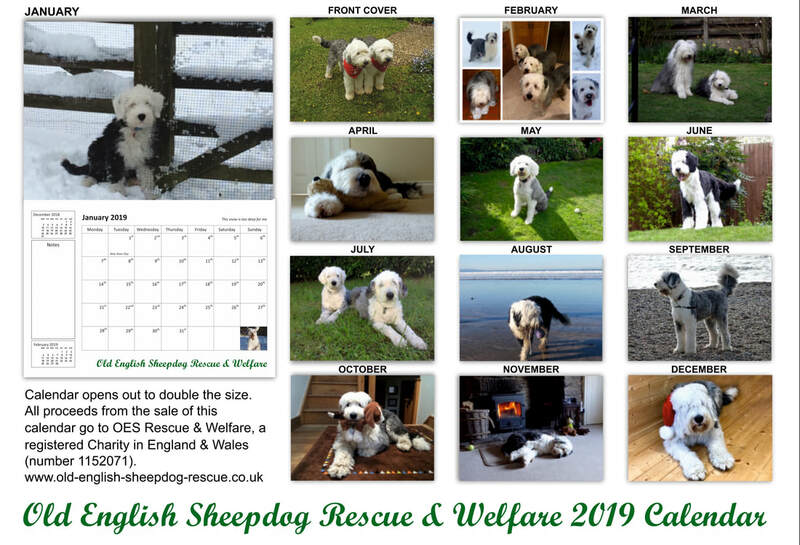 NEW 2019 Calendars and Christmas Cards now available (while stocks last). Our 13 page calendar is better than ever. it opens to double A4 size but not double the price! Once again it features rescue dogs at play and rest all looking happy ! ​The front cover features our very first rescue pet blood donors. 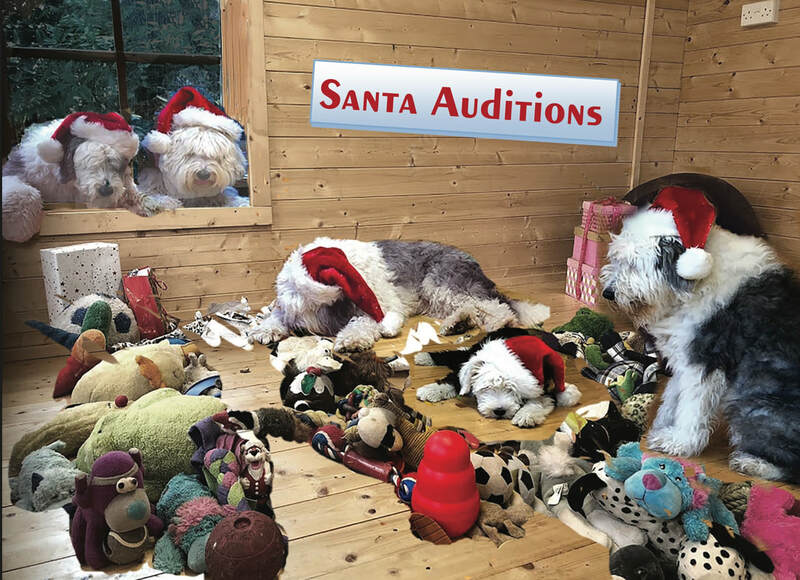 Our new card for this Year "Santa Auditions" Unfortunately the dogs were very competitive and rather keen to get opening! ​ Click here to see more. If you need help or advice caring for your Old English then please contact us. We understand how getting the right help for your dog can mean the opportunity for your dog to stay with you. In April 2016 the Law on microchipping will change so that not only will all dogs need to be microchipped, they chip must be registered in the name and address of the Keeper of the dog - that is, where the dog normally resides. This will be done for all dogs rehomed by us and new owners will receive a confirmation certificate. ​However, this may not be the case for dogs previously re-homed by GILL HARWOOD OLD ENGLISH SHEEPDOG RESCUE AND WELFARE FUND. We suggest contacting Gill in the first instance, if you have a dog re-homed from her. ​If you do have one of Gill's dogs, we are also happy to re-register the chip for you - free of charge, please contact us. Please remember, once you have your certificate, if you change address or contact details, you must get your microchip records changed otherwise you will be breaking the law. We take child safety very seriously and have been upset to learn that recent information indicates that dog bites and dog attacks on children have increased. It appears that most children have not been shown how to behave safely around dogs and most dog owners are unable to recognise signs of stress in their dog - until it is too late. Dogs often show signs through body language that they are tolerating and not enjoying the situation they are in. With this in mind, we have produced 2 bookmarks, depicting 3 steps for meeting a dog safely for children and 6 common stress signals in dogs. We have made these bookmarks available free (while stocks last). Please see here for information on how to receive your free bookmarks. Unfortunately, we are unable to provide free postage and packing for these. We are also happy to supply to breeders to include in their puppy packs. Rescue dogs promote the versatility of the breed and responsible dog ownership & training; in the KC Good Citizens Dog Scheme Ring at Crufts, March 8th 2013. If you need help caring for your OES, please do contact us, it is far better to seek advice from someone who truely understands this breed. All breeds are different and have unique qualities and special requirements. 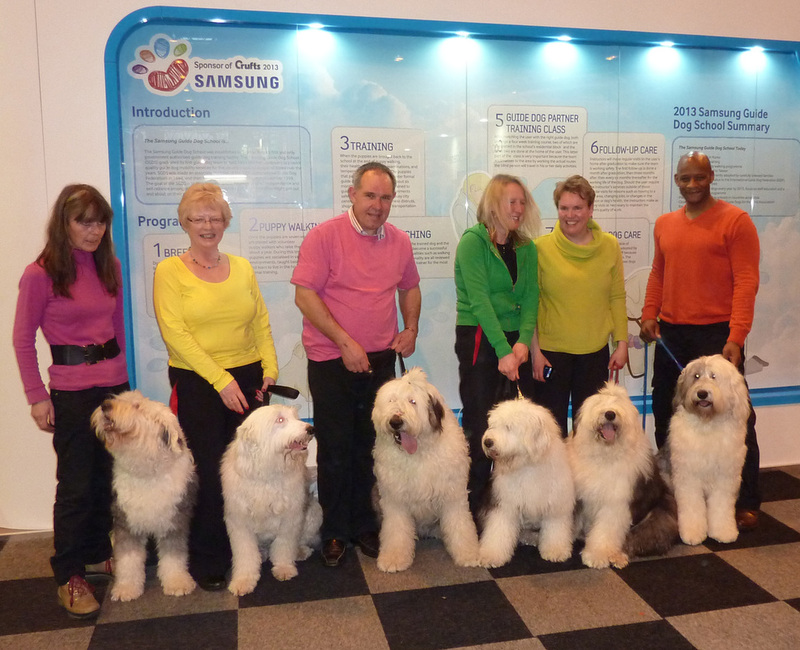 The Old English Sheepdog is very special and each dog a very special individual!